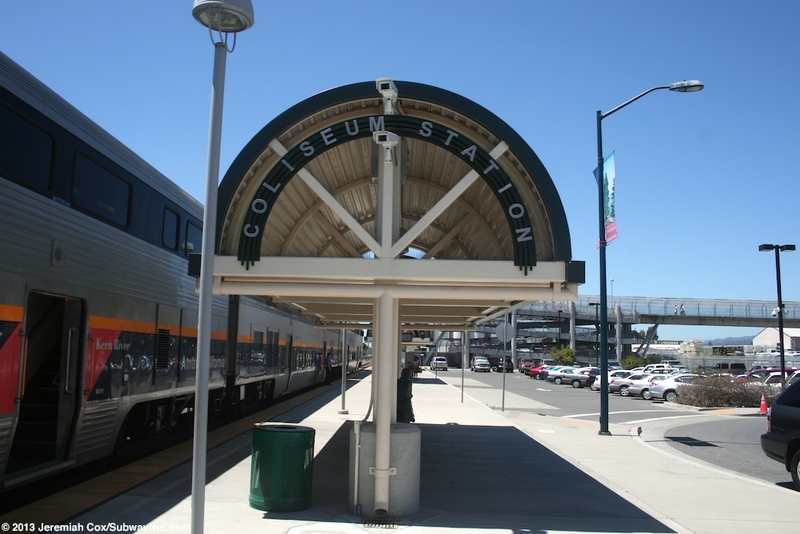 The Oakland Coliseum Amtrak Capitol Corridor Station opened on May 25, 2005 to serve as a southern connection to BART for riders coming from the San Jose direction to compliment Richmond for those coming from Sacramento. 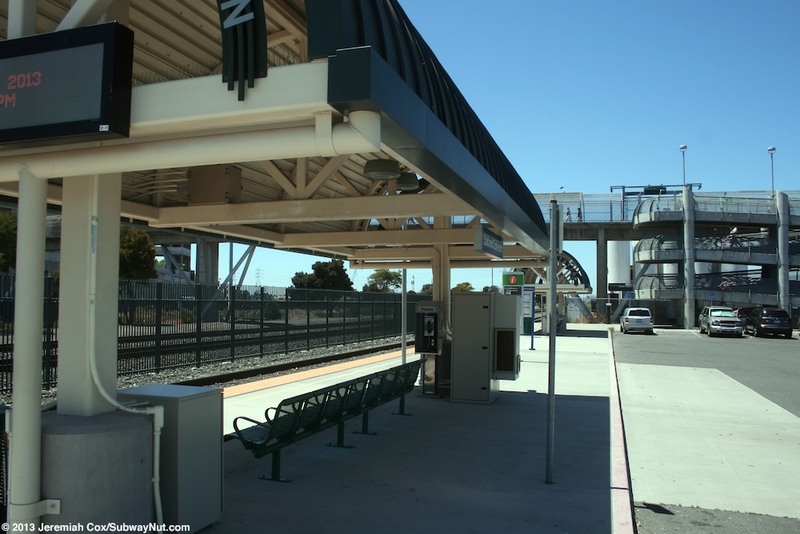 The Oakland Airport is just a short bus ride away via AC Transit Route 73. 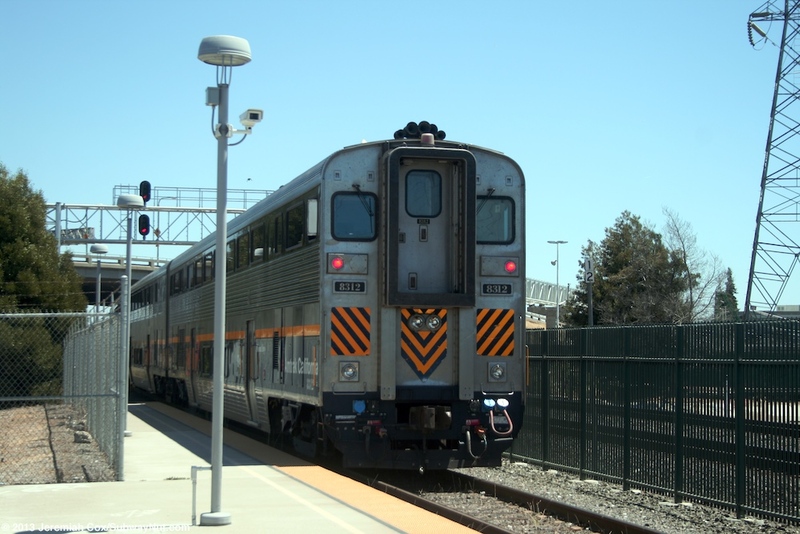 This is a free transfer to arriving Capitol Corridor Customers that get a Transit Transfer from their conductor. 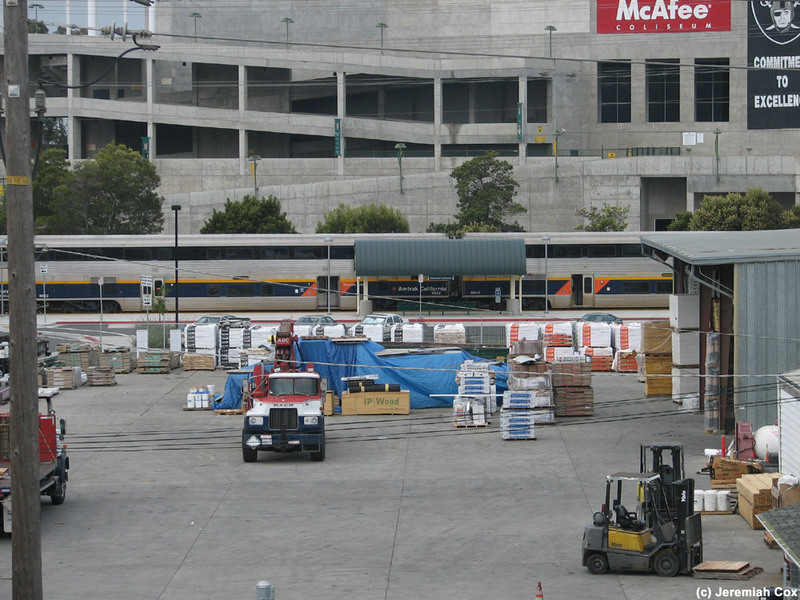 AirBART buses can also be used but is more expensive at $3 each way and no transfers provided. 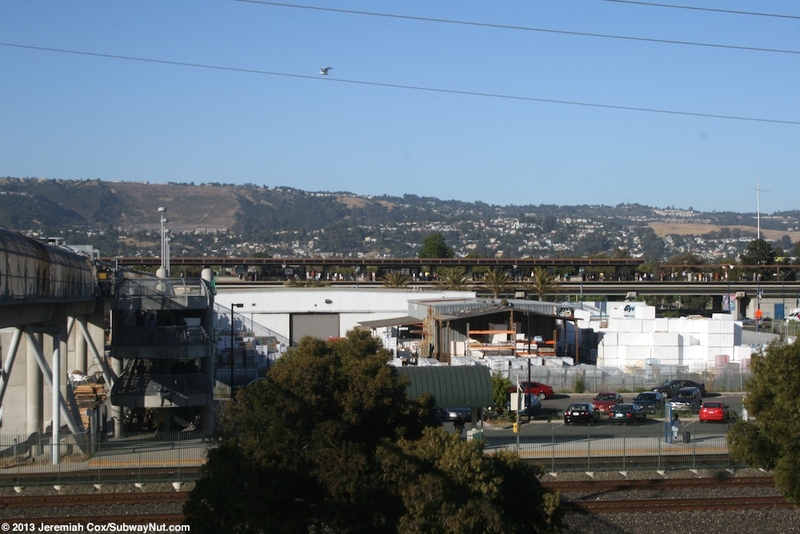 BART is currently building the Oakland Airport Connector. 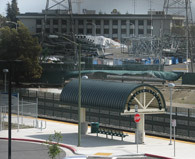 This is a people mover that will run from the BART station into the Airport. 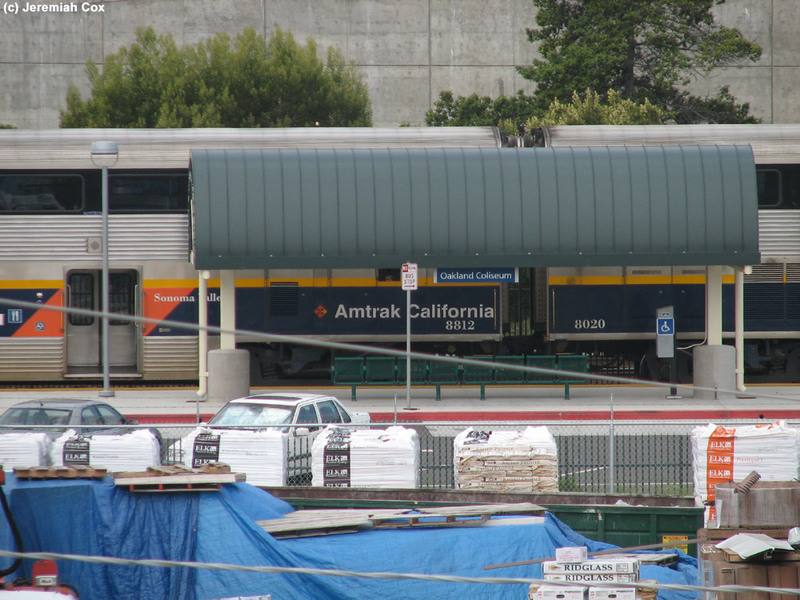 It will cost extra for Amtrak (and all other riders) since it will be integrated into the rest of the BART system. 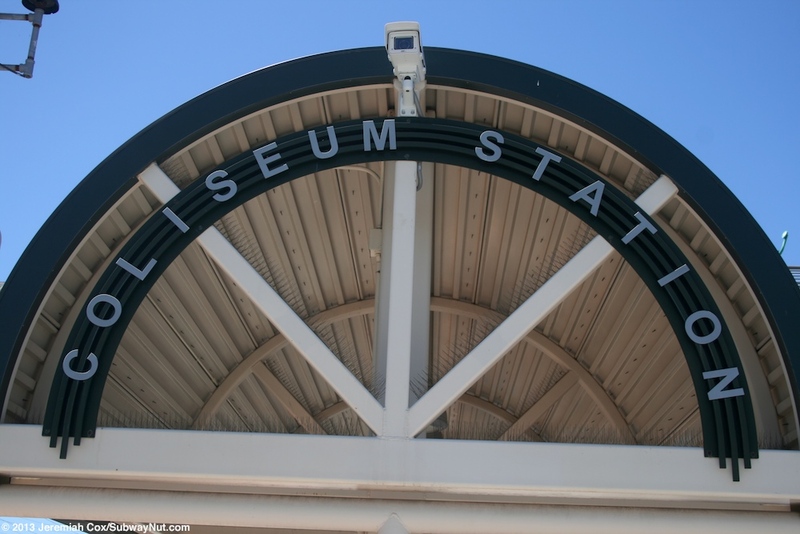 Amtrak passengers will have to buy a BART ticket to ride it into the Airport which will have its own fare gates separate from those at the Coliseum. 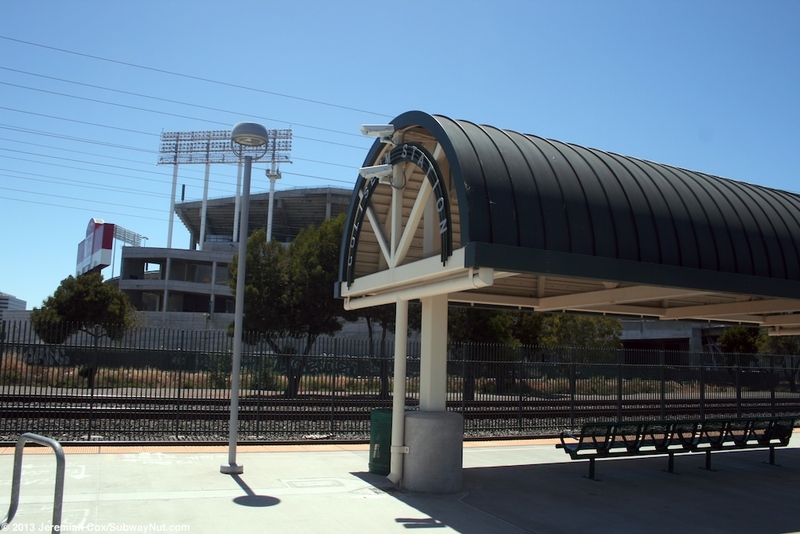 During game days the station also serves three major sports teams as the Oakland Coliseum directly behind the station and home to the Oakland A's Baseball Team and Raiders Football Team and the Coliseum Arena home to the NBA Golden State Warriors (These have corporate names that are constantly changing). 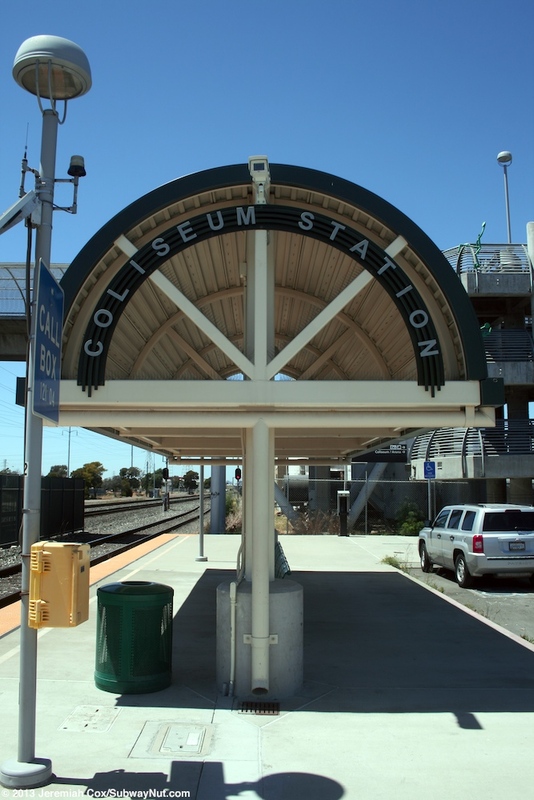 For the early years of the station (at least in 2006) a San Joaquin Train was extended one stop to Oakland Coliseum to serve Raiders Fans on their game days, before the station opened special thruway buses would connect at Oakland-Jack London Square so fans could reach the stadium. 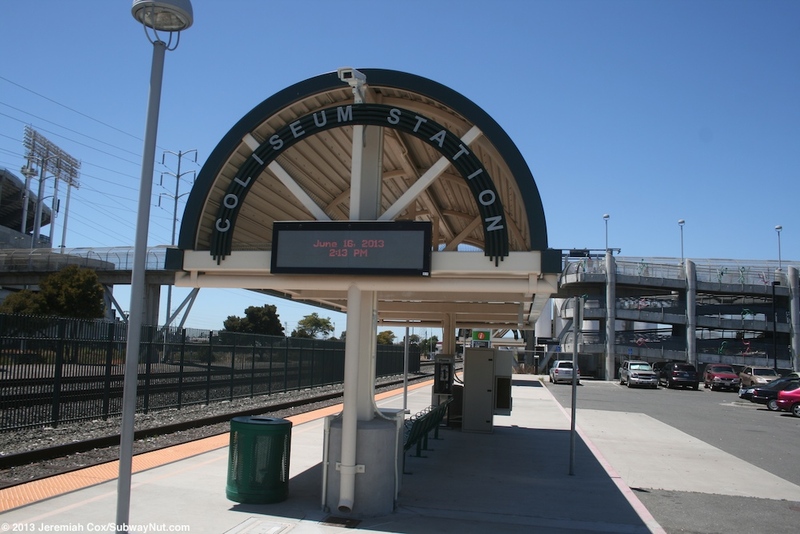 Finally the Altamont Commuter Express has done special Oakland A's excursions on a couple of occasions from Stockton with the train required to change-directions to reach the Coliseum Station at the end of Niles Canyon when it joins the Amtrak train. 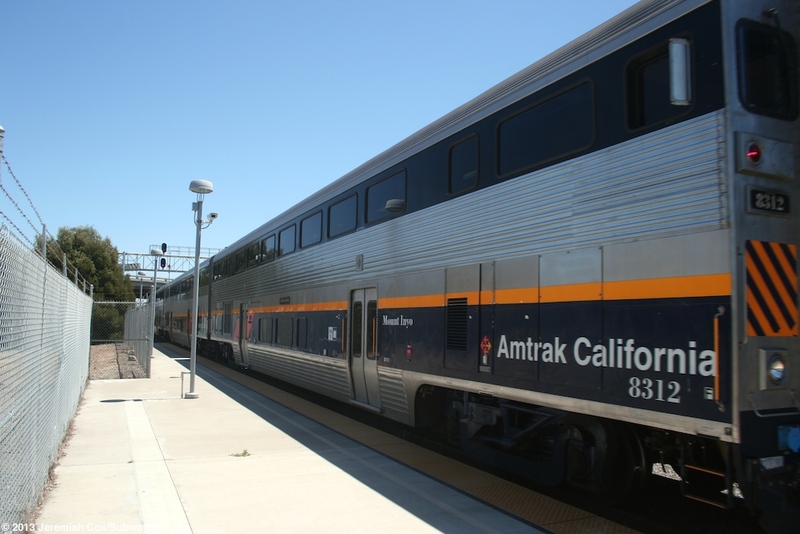 The station receives an unusual schedule regular schedule from the Capitol Corridor because it's not just the seven daily round-trips to San Jose that stop at the station but also some trains from Sacramento arrive and terminate. 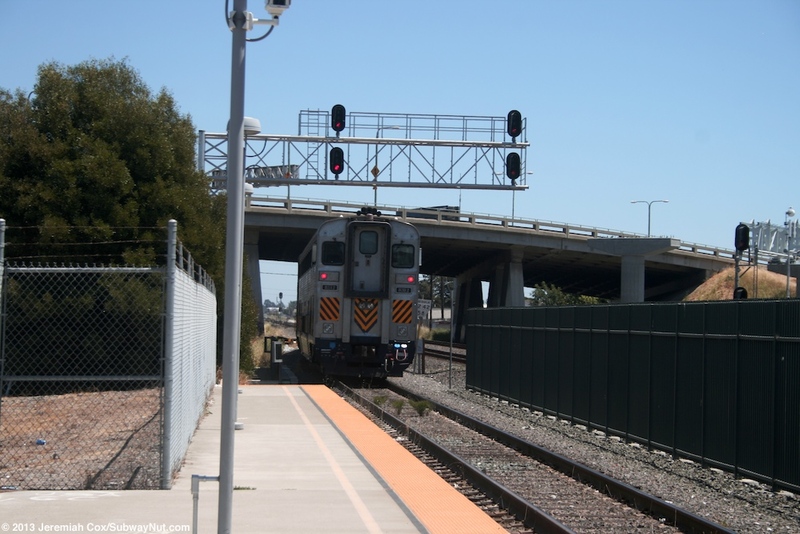 This service isn't at all balanced: During weekdays 4 weekday southbound trips (all 4 AM trips that terminate in Oakland) but just 1 northbound originating train suppliment the San Jose service at the station. 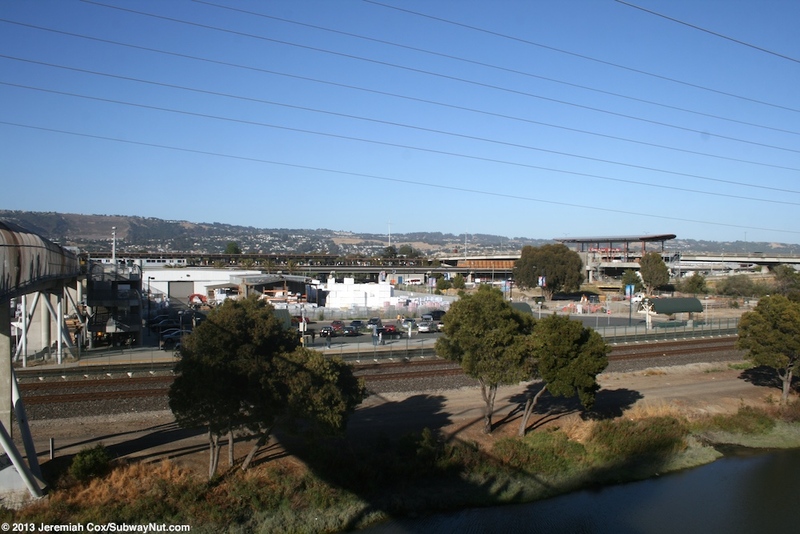 Weekends has one morning trip in each direction (that aren't timed to turn at Oakland but must be deadhead back through Jack London Square to the train yards beyond that station). The station has a single platform for a single track that is a siding along the two track main line, there are switches beyond each end of the station platform where the siding ends. 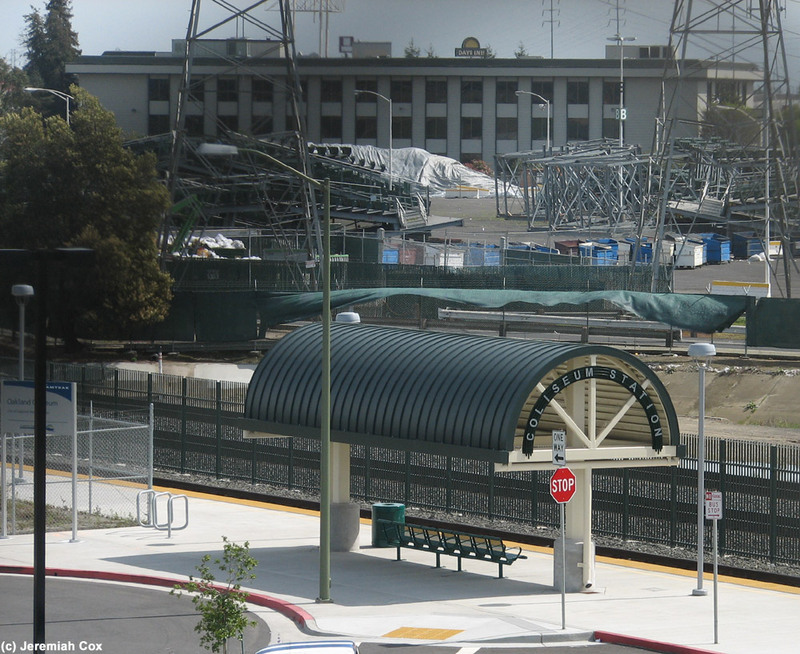 A high green fence separates the station track from the two main line tracks used by freight trains and the Coast Starlight that don't need to platform. 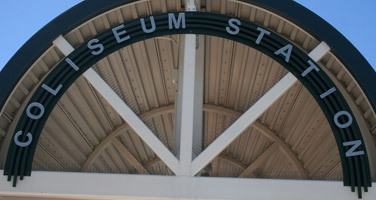 The platform has three green half-circle canopies, each of these is held up by cream colored framing and Coliseum Station is written in silver letters that are curved to follow the arched roofline at each end of the canopy. 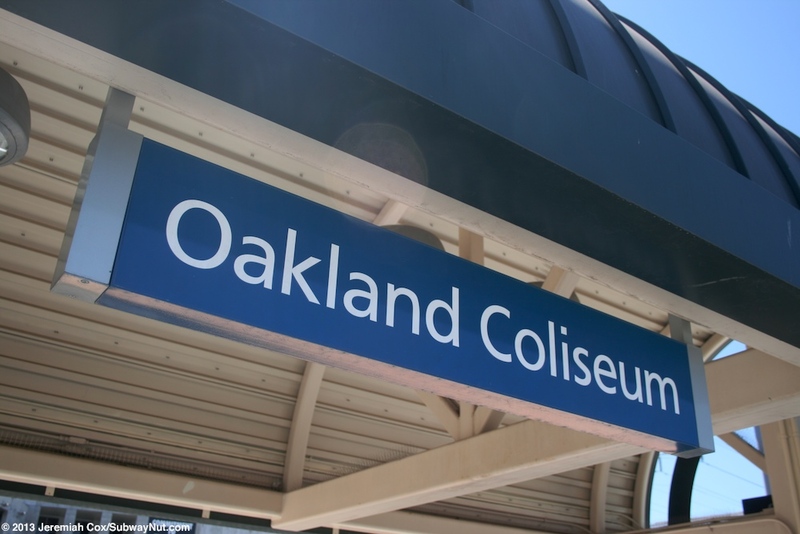 Additional signage is minimal with just a single white text on Blue Oakland Coliseum sign that hangs down from the middle shelter. 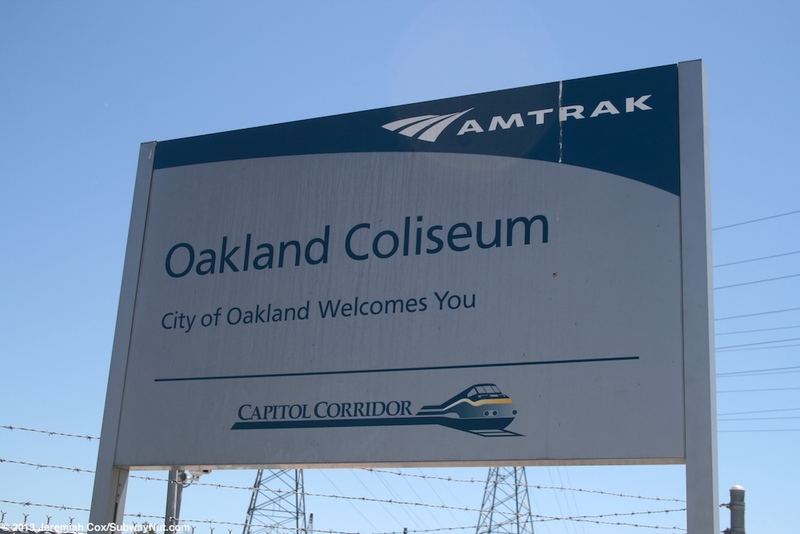 At the soutern end of the platform is an unusual Amtrak grey sign (in the style of modern signs) that says Oakland Coliseum, The City of Oakland Welcomes You above the Capitol Corridor Logo. The shelters only cover green benches for waiting passengers, there is no station or Quik-Trak Machine at this stop, its fully unstaffed. There is also a payphone, green garbage cans and a smaller (California style) Passenger Information sign that has a posted schedule. 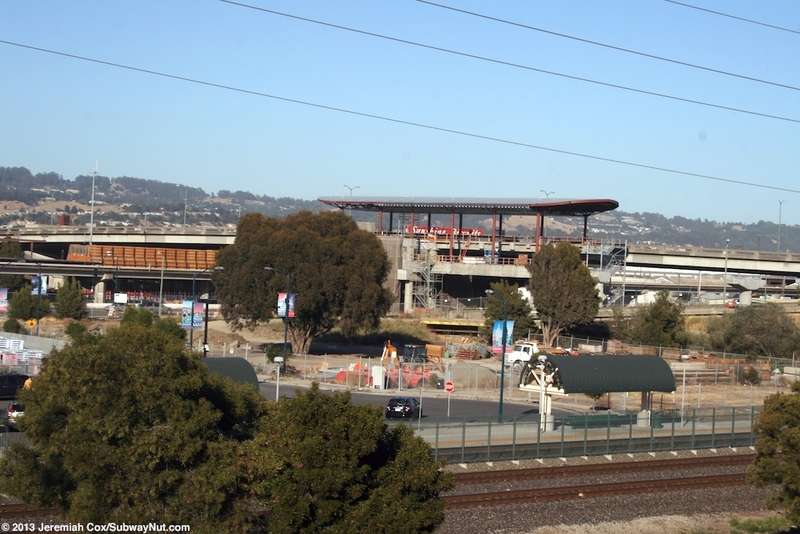 The platform is along a small 35 space parking lot with a sign saying there is a charge for parking during raiders game (the Amtrak website mentions 400 spaces but this must include either BART's Parking lots or some of the Stadium/Arena Parking lots). The entrance to this parking lot is at its southern end at the end of 73 Avenue. A wholesale building distributer of roofing and siding is along the rest of the station parking lot. 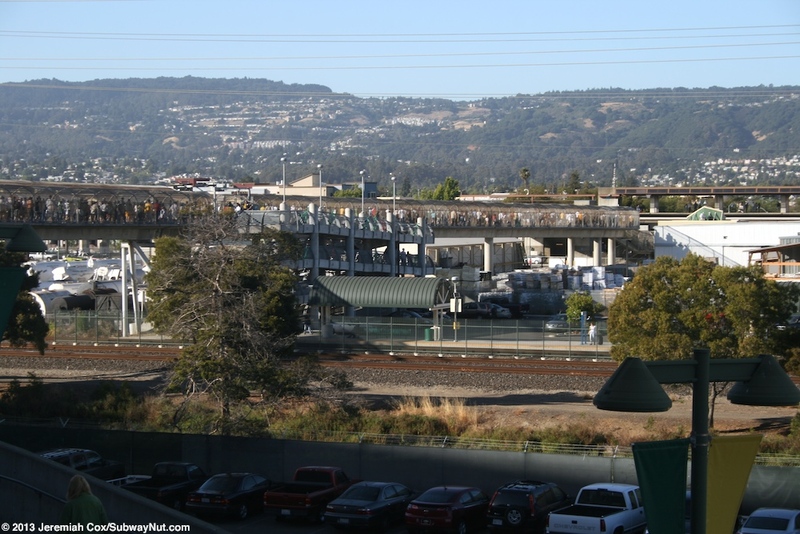 The main way most passengers reach the station is via the concrete pedestrian bridge that connects the BART station and the Oakland Coliseum (arriving at dead center field) crossing over the railroad tracks and northern end of the station platform. 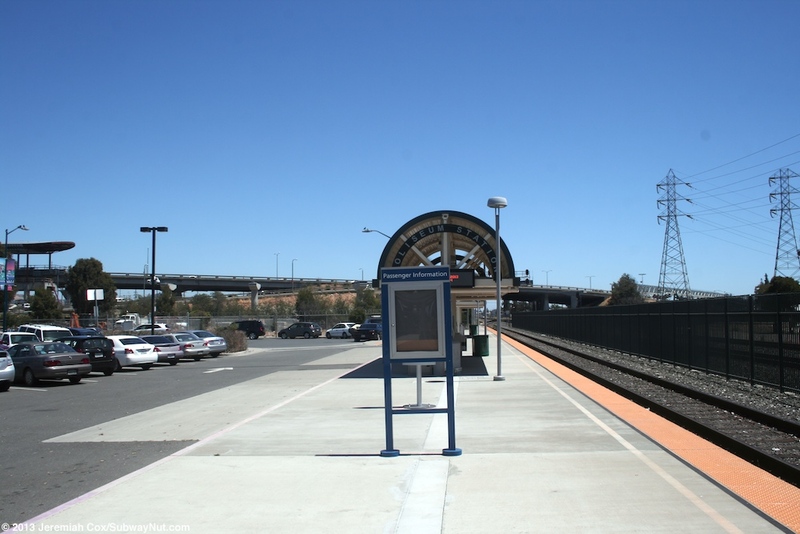 This bridge has a long 3-level concrete ramp (no stairs) that wends its way down to the Amtrak platform, there are no stairs to bypass the ramp. 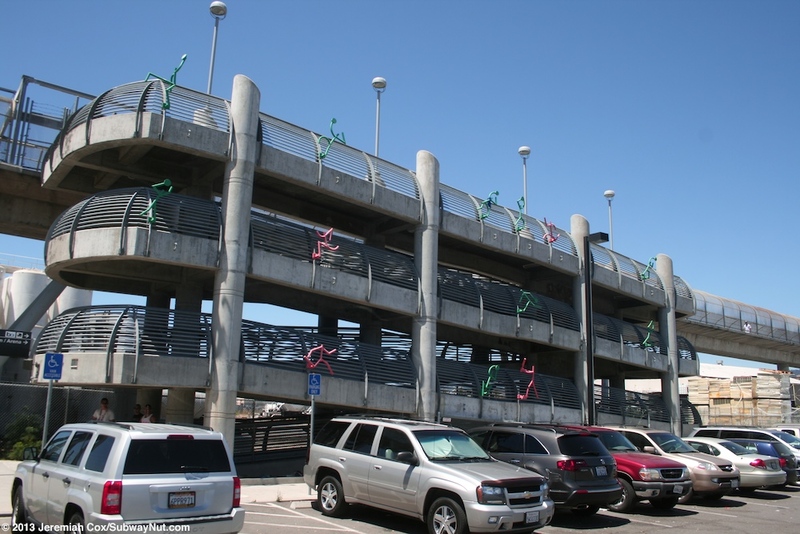 It is decorated with abstract red and green stick figures that look like their playing spots.